Our blog’s ongoing “On the Books” series introduces you to writers from our growing list of Fresno State MFA alumni who are getting their first books published. 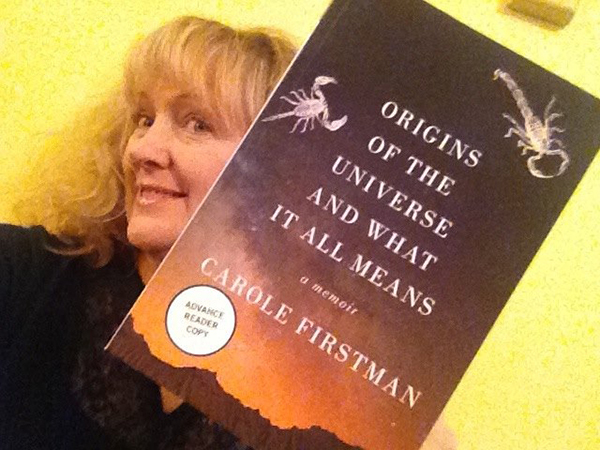 The fourth installment profiles Carole Firstman. 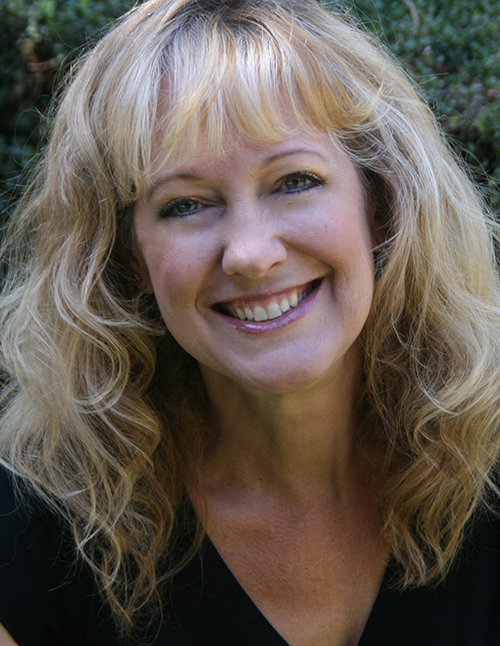 Her writing has appeared in the Colorado Review, the South Dakota Review, the Watershed Review, and elsewhere. In a May phone interview, MFA communication specialist Jefferson Beavers spoke with Carole about turning essays into a memoir, finding new ways into a teaching career, and learning to build your own literary community. I did the four-year plan. I started in 2009 and I graduated in 2013, in creative nonfiction. What were your first thoughts when you learned that your book, Origins of the Universe and What It All Means, would be published? I couldn’t believe that it was actually true! I was so excited. It’s funny because I graduated in 2013, and I spent that first summer right after I graduated – I mean literally, the whole summer – dedicated to finding an agent. I spent so much time researching and querying, and nothing happened. So then the next summer, I thought, I’ll just start sending out the book. I’m going to widen my search instead of just agents, try some publishers directly. So, I had sent out to a bunch of places, and within the mix I happened to enter the Dzanc Books nonfiction book contest. And then I hadn’t heard back from them in so, so long. I thought, oh certainly they’ve already chosen somebody. Their timeline wasn’t really clear on the website, but somehow I assumed that they’d already chosen somebody. I had made a decision – I think it was on a Friday morning. I thought, I’m just going to bite the bullet and withdraw it from the Dzanc contest. I’m tired of seeing the one little thing on the Submittable page that says “in progress.” [Laughs] I’m kind of OCD that way. I have some obsessive compulsive leanings. It was bugging me that it was “in progress,” yet I thought they had already chosen somebody. So I put it on my to-do list that on Monday, I would withdraw it. And then on Friday afternoon, I got the call. It was amazing, and it was a good thing I didn’t withdraw it! At first, I was in shock and in awe. I was excited, of course. And then for almost a year afterwards – because it takes a long time, from the time that it’s accepted until publication comes – I was just positive that anytime I got any email or any phone call from Dzanc, I thought, well, they have finally come to their senses and they’re calling to cancel. Surely they’ve made a mistake? [Laughs] But then it finally felt real long after I signed the contract, once I started doing the back and forth edits with my first editor. You recently posted a photo on your Facebook page of the galley proofs when they arrived. I assume it all felt real to you then, holding the book in your hands? Yes, that was actually a real turning point for me, to get those galleys in the mail. Even though I’d been going back and forth in the editing process, it still felt like this someday, far-away thing. But then when I got the galleys, I think that I sat at my dining room table – my husband got sick of hearing me – just fanning through the pages over and over and going: Wow. Wowwww. Wow! The book felt like an entity then, in itself. Your book grew out of your Fresno State MFA thesis manuscript. What was the process like, taking what was your thesis and making it into something more? For me, I actually had in mind a book when I put together my thesis. So there were some changes. But the real big thing was, so it’s time to do my thesis. And like many of us – now it’s the semester where I’m taking thesis units and I’m not taking classes, and I’m just going to write this thesis – I’ve now got this series of essays I’m looking at. Because that’s what we write in graduate workshops, a bunch of essays. At first I thought, I guess I’ll do a book of essays. Then I remembered my original goal, when I first enrolled in the Fresno State MFA program. The whole reason in the circuitous chain of events that got me there was that I had written a novel that was terrible. I didn’t know it at the time, that it was terrible. I realized after working on that manuscript for years that I had reached a ceiling in my skill set, in my self-taught knowledge. So I enrolled in an MFA program because I thought, I want to know how to turn this novel I have into a good book. I want to learn how to write a book. This manuscript I had needed so much work, I didn’t know where to begin. When I applied to the program, thinking I was going to work on this novel, I quickly realized that I was tired of that old book. I didn’t want to work on it anymore. I needed to get my mind out of that and into new stuff. But then, that’s not really what we do in creative nonfiction in the MFA program. We write essays. So, I had kind of forgotten that writing a book was my original goal. In my four years, I wrote a ton of essays. So when I sat down for my thesis semester, I thought, you know, I didn’t get into this to write a book of essays. I got into this to write a book that I could sell, and nobody’s going to buy a book of essays from some unknown person. We all know that’s how it works. So then I looked at what I’d written and tried to turn it into a book. What were your steps in turning your essays into a book? I’m really a visual, hands-on person. So I re-printed or found a hard copy of every single essay I had written during my four years and I laid them all out. I thought, which ones of these could I group together that would have some sort of theme to them? And it ended up that only maybe four or five of my pieces, out of a bunch of stuff, had a theme to them. So I put everything else aside and I took those select essays and that was the beginning of the first part of putting together a book. What I ended up doing is that I really cannibalized myself a lot. I ended up slicing and dicing those pieces and taking them apart. Literally, I cut up the pieces of paper sometimes and did all these weird things to the hard copies. Those were the heart of the stuff that I had originally written. At first I thought, oh this will be easy. All I have to do is slice them and dice them a little bit, write some connective tissue to hold them together and I’ll be done. Right? But it ended up, I wrote far more connective tissue than the original essays. More than half of the book ended up new stuff that I wrote, to connect the early pieces. And hopefully those connective tissues are invisible to the reader, to hold the whole book together. I like how you describe the physicality of slicing and dicing actual paper. Do you follow that process with all of your writing? Sometimes I do and sometimes not. I have an office at home – one of our rooms is converted into an office – and there are times that I have so many pieces of paper taped up all over the walls. It looks like you’ve walked into the movie set of A Beautiful Mind or something. It’s just stuff everywhere. So I do sometimes do that physical stuff, the cutting of paper. I first fell upon this process during my self-taught mode, before the MFA. I was trying to wrap my head around how structure works. So I actually took a book, a short novel I had read, and I photocopied the entire book. It had these three narrative strands in it, and it kind of went in a non-linear fashion. I wanted to see how that would look if I cut apart the book and studied it. I actually made these three gigantic, long scrolls. Photocopied the whole book, cut it up physically with scissors, made the scrolls, so I could see where these all go together, and these all go together, and these all go together. It turned out, I could see then what the author must have done. Each part was its own almost self-sustained narrative. I spent weeks doing that. Let’s talk about your book now. Chapter one of your MFA thesis manuscript had a single sentence: “In the beginning there was darkness.” And then on to chapter two. Did that single-sentence first chapter carry over into your memoir, and why? Yes! That’s still the opening to my book. The book is about origins of life of all different kinds. Part of what I examine in the book and part of the themes that run through it are the origins of life on Earth, my own family of origin and where do I come from, the origin of the cosmos. And I also explore, in greater or lesser detail, different stories of origin. This first chapter, we’re in the darkness. And the next chapter, we’re in the desert and it’s very bright. So that’s sort of a play on the biblical version, in a way, of the origins of life, and also my own coming out of the darkness and into the light. That theme, from darkness to light, plays out in other places in the book as well. Can we talk about the book’s title? Origins of the Universe and What It All Means. How did you decide on the broad, sweeping title, especially in terms of marketability? There are three parts to this answer, I guess. 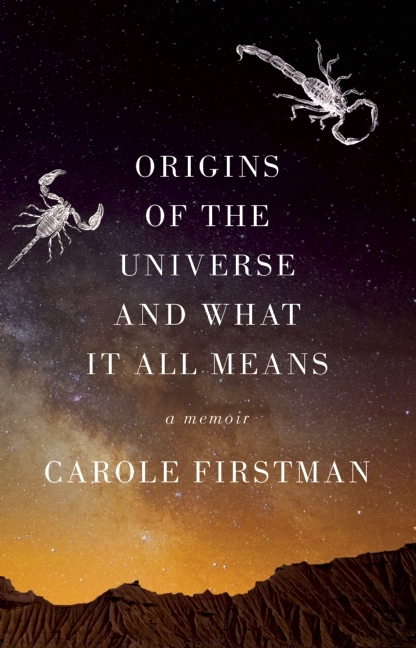 First, in the book there’s my dad – it’s a father-daughter memoir, about the relationship with my dad – and one of the things he is really obsessed with is the origins of the universe. He is really obsessed with the cosmos and the stars and all of that stuff. It comes up over and over and over again, within our narrative. There’s also a turning point for me in my life, and that’s in the book, when my dad and I had been estranged for a number of years. I was in my 20s and we kind of re-connected. We were talking on the phone. He lives in Southern California and I live here in Visalia, in Central California. We were talking and he says, hey, we should go down to the Mexican desert and go to the places we used to go when you were a kid. My dad, for all of his life, has went down to Mexico, especially to Baja, to collect spiders and scorpions, and when I was a kid I used to go with him and my mom. So we were planning this road trip and he said – and this is a line he says over and over in the span of my life – he said, there are so many things I want to talk to you about, about life and the origins of the universe and what it all means. That bit of conversation is in the book. While I was working on my thesis and I was meeting with John Hales, my thesis chair – who, by the way, went above and beyond the call of duty; I owe everything to John and all of his hard work – John said, wow, that could be the title of the book right there, that line. I thought, yeah? And we laughed and I kind of forgot about it. Later, you know, I thought, that is the title of the book! There’s also a third thread. To me, it’s a humorous title because it’s very serious. It promises a lot, right? But this is a memoir after all, right? Then I think of the book by Dave Eggers, A Heartbreaking Work of Staggering Genius, and I always thought that title is hilarious. He’s poking fun at himself right there in the title. So yeah, those are the origins of the title. How did you find about Dzanc Books, and what about their work is a good fit for your memoir? They publish, I think, really smart, good work. Kind of cutting edge. Their books have just a bit of mainstream feel about them, but also not mainstream. They’re still independent. I like the variety of work that they publish. It’s different. I also like that they do other things, like their writer-in-residence program and mentorships. Dzanc is also a nonprofit. I feel like there’s not that same pressure, you know. Your book has to sell X number of copies or we’re going to discontinue it. Their setup gives them more leeway than that, and I’m not feeling that kind of pressure. I feel like my book’s going to be around and available for a long time. Outside of writing memoir, what work are you doing to make a living? I remember the TA interview – John Hales was there, and a committee of English professors were there, like Virginia Crisco and Rick Hansen – when I said the funniest thing. They asked, what makes you think you would be a good writing teacher here at the college level, because you previously taught elementary school? And I said, oh you know, I’ve been teaching so long, give me a teacher’s manual and I can teach anything. And they looked at me and they were like, um, there are no teacher’s manuals here. [Laughs] In elementary school, it’s all laid out for you. A, B, and C, do this, then this, then this. So I knew this would be a tremendous bonus for me, to be able to come out of the program and to teach writing without a teacher’s manual. Seems like that question and your answer was the beginning of your graduate education. Yes. You would think that you could be an elementary school teacher and then it would be easy, and you’d just get some certificate and then you’d be a college teacher, but that’s not true at all. It’s starting completely over. It’s two different approaches and career paths. Once you’re in the Fresno State MFA program, if you go through the steps to become a teaching associate and you get your MFA, you could have a teaching career after that. Currently, I’m teaching as adjunct faculty at College of the Sequoias in Visalia, and I’m also a lecturer at Fresno State. I just took a year’s leave of absence from Fresno State this past year to teach full-time at COS. But starting this fall, I’ll bring Fresno State back into the picture and teach a couple classes at both places. Before that, I was teaching at a lot of different community colleges. Like, an ungodly amount. One time I had seven classes, I think, at four campuses, teaching 24 units. So I’m teaching! And that’s great, it’s working out really well. Having the book come out will hopefully help my search for a long-term, permanent teaching position in the future. It’s sure not going to hurt. You also do some freelance writing and journalism too, right? Yes. I’ve been a freelance journalist for 15 or something years. I did a lot of that before the MFA program, then I kind of had to stop doing it during the MFA program. Now, I’m getting requests from the places that I used to write for, to write for them again. At the moment I’m declining because I sort of have my plate full with teaching and doing what I need to do to get the book off the ground. I don’t have time right now, but I know that I could do that again if I wanted. I think my goal, when I’m ready to go back to some journalism, will be to broaden my horizons. Maybe write for some different audiences than I have in the past. Recently when I was at Bread Loaf, I met the editors of several magazines that would be really awesome to pitch. Like the editor of Outside Magazine. He told me, send me some proposals, and I told him a couple of ideas that I had. He was encouraging. But I’ve been so busy with teaching and with the book that I haven’t followed through yet. What about your MFA experience at Fresno State has stuck with you? One of the things that has really stuck with me is the importance of becoming a member of a literary community. I’d heard people talk about that or I would read about that before I did the MFA program, but “literary community” seemed so abstract to me. So I participated in everything I could. I was hungry to be involved. For the first time ever, I was part of a literary community. You have the people you are in classes with and in workshops with. When we would have guest authors come to campus, I would go to those. The readings, the lectures. Even though I lived in Visalia, 45 minutes away, and was commuting back and forth – that did make things a little harder – I really wanted to participate in stuff. For the first time ever, I had people to talk about writing with that were my peers. And that would help me really digest the information I was taking in. One friend in particular, we would go to CSU Summer Arts together, and we would talk about all that stuff when we were having lunch. Being a part of that and everything on campus got me, in many ways, plugged in to what it means to be part of a literary community. What else did you learn about being in a literary community? The Fresno State MFA helped me become part of a larger community outside of campus. The nonfiction faculty, Steven Church and John Hales, really pushed us to go to conferences and to receive financial support to go to those conferences. I would never have even known what AWP was, if it wasn’t for the MFA program. And I probably wouldn’t have gone, that first time I went, if I hadn’t been offered funding. Once I went, I was like, oh my god, I’m coming to this every year for the rest of my life until I die. Right? Because it’s so wonderful. I also went to Tin House with funding. Later, after I graduated from the MFA program, I went to Bread Loaf. Being a part of all that was great. Steven and Alex Espinoza and other faculty hosted some meetings, and we would talk about where all the summer programs and workshop type things were out there, so we would have them on our radar and learn how to apply to them. Also, I learned how to talk to writers – even though I was scared to death – to have a conversation with all the authors that came to campus. People like David Shields and Susan Orlean and Dorothy Allison. Even if it was just a little something, you know, like going up to them at the cocktail table afterwards, or going up to them after the reading and signing my book, it was great to be part of that. Some of those authors, I’m actually now in contact with. They eventually become sustained contacts. With the faculty, and for me with Steven, we would ask him specifically about the publishing world during some of our workshops. We would spend a lot of time talking about who the literary publishers are out there. Who are the good ones? Who are the not-so-good ones? Which are more reputable? How would you rank them? Which ones are online and which ones are print? What are those plusses and minuses? How often should you submit? Like, all of that! I never would’ve had a clue about any of that if it wasn’t for the Fresno State MFA program. I have two books in mind, and I have some start on each of them. From now on, I’m in book mode, thinking of projects in terms of books. One project, and it sounds really crazy, is a literary journalistic examination of our obsession with mythical creatures like Bigfoot and other unexplained phenomenon. I know that sounds wacky, but I’ve already started doing some field research. What does that field research entail? I actually went on an official Bigfoot search expedition with a group of professional Bigfoot researchers. It was up in Northern California. You know that famous Bigfoot video taken back in the ’60s? They call it the Gimlin-Patterson film, where Bigfoot walks across and it looks like a person, and it turns and looks. I went with this group, they’re called BFRO, the Bigfoot Field Researchers Organization. They have that Finding Bigfoot reality TV show on Animal Planet. I was not on a TV episode, but I went up there with this group and we were there for a week, Bigfooting at night and doing all of the things, with their fancy equipment. We went to that exact site where that original film was made. It was crazy. It was really fun. What I’m interested in, as a writer, is: Why are we so obsessed? Why do we hang on to those kinds of myths? Why do we want to believe so much? Like, we have every technology known to man. Yet we still have people out there looking for the Loch Ness Monster and looking for Bigfoot. Nobody can actually find them, but we kind of want to believe that those things are there. So, my question is, why are we obsessed with that? And what is your other project idea? I’m going to return to that original novel I first started – you know, the one that was horrible? But I’m going to rewrite it as nonfiction. Before I did the MFA program, I didn’t know you could bring fiction into nonfiction. It’s going to be a hybrid. It will be a mother-daughter memoir, about me and my mom, but it will also be a blend of biography. It will be about my mother and her mother, my grandmother, who I never met because she died when my mother was a child. If you’ve ever read The Color of Water by James McBride, I’m thinking of that type of structure. He interviews his mom, and it’s alternating chapters of her story and his story. So for my book, I envision it as alternating threads. My story, the over-arching narrative is me and my mom, in the present day, we have my grandfather’s ashes in my backpack and we are taking them to Arkansas to bury his ashes at my grandmother’s grave, which my mother has never been to. That will be the present tense. Then you’ll also learn my mom’s childhood story, which is its own story. My time in the Fresno State MFA program was a real life changer for me, and I didn’t realize it at the time. My life took a turn because of the program. I had applied to three different places, ours and also two low-residency programs. I had taken a fiction workshop with faculty Alex Espinoza – I had taken it just because – and he said, hey, you ought to think about joining an MFA program. He encouraged me to apply to different types of places, so I would have a choice. So I applied to three places and was accepted to all three, and then I had some thinking to do. I’m really glad that I went to Fresno State, not only because the professors are awesome – I just think the world of John Hales and Steven Church especially, they are amazing mentors – but also for me and my learning style, the face-to-face traditional program, where you’re with other writers all the time, that was the best fit for me. I know the low-res option is a better fit for other people, but not for me. I’m really glad I came to Fresno. It really took my writing to a whole other level.